This foil-wrapped grilled vegetable recipe is a snap! Some vegetables can be difficult to cook on a grill. 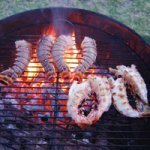 They tend to be softer and smaller and therefore can fall through the grill grate and into your fire! While some bigger vegetables can be cooked right on the grill, this grill recipe allows you to cook smaller or cut-up veggies without worrying about them falling into your grill. Because the vegetables in this grill recipe are wrapped in foil, they basically simmer and steam in oil and their own juices, along with any seasonings you add to them. This results in tender and savory flavors which are aromatic and delicious. This a grilled vegetable recipe to throw together fast with whatever you like, so don't sweat the details of which types of veggies to use or exactly how much oil or salt to use. Throw it together with what you have available and enjoy and it will come out great! I like to serve this grilled vegetable recipe as a side dish to accompany any other grill recipe, especially as a side to grilled meat. Minced garlic - A couple cloves of garlic adds some nice flavor. Use more to taste. Extra virgin olive oil - A few tablespoons, depending on how much grilled vegetable you have. Assorted herbs and/or spices - I love to use Herbes de Provence which is a mixture of herbs and spices from the south of France (Provence). It includes dried rosemary, thyme, lavender, fennel seed and sometimes marjoram and sage and other great herbs. It is a nice combination of natural flavors to accent the grilled vegetable recipe. But if you don't have this available, get creative with what you have. Use some of the herbs listed above or get crazy and make something completely different. Would you call me crazy if I added turmeric, ground cumin and coriander to my veggies for a nice Indian treat? Coarsely chop your veggies into bit size pieces. Drizzle over olive oil generously and lightly toss the vegetables to coat. Sprinkle with herbs, freshly ground black pepper and salt, to taste. Lightly toss to distribute. 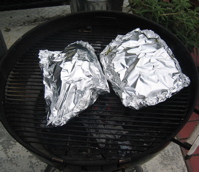 Lay out one or two layers of aluminum foil on your work surface. Pile up the vegetables in the middle. If you are making more than a couple cups worth of vegetables, separate them into separate foil packets. Either fold the foil around the vegetables and secure on top or lay another layer of foil on top and bunch up the edges to secure it. You want your foil packet of vegetables to be closed on all sides. Also be sure that where you close the foil is facing upward. 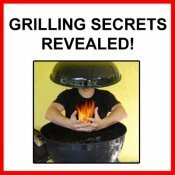 If the seam is on the bottom of the packet or facing down, your oil and other liquids will simply drip out into your grill. Up to this point, you can prepare your vegetable packets slightly ahead of time while you prepare other food or prepare the grill or fire pit. Do not leave the vegetables sitting in the oil for more than a couple hours however. Put your grilled vegetable foil packets directly on your hot grill. After some time they will start to steam and sizzle. Cooking time varies depending on the hardness of the vegetables (more time if hard veggies like potato and carrot are included), the size of the pieces, the size of your packets and the heat of your grill. In very general terms, you will need at least 10 minutes of cooking time and up to 30 to 40 minutes if you have large pieces of potato or carrot which need time to soften. You can also cook more or less to your taste if you like your veggies more well done and soft or more on the crisp and fresh side. If all else fails, remove your foil packet from the grill to a plate or platter (I find a large spatula the best way to do this without the foil packet breaking or falling open). Carefully open the packet (the steam will be hot!) and check your veggies for doneness. 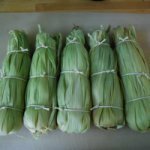 If they are not done to your liking, simply wrap them back up tightly and put back on the grill for a while longer. When done, remove the veggies to a serving bowl or platter and discard the foil. Taste for salt and pepper and add some if needed. Your grilled vegetable dish is now ready to serve alongside the rest of your delicious grilled recipes! Done with the grilled vegetable recipe? Go back to the Barbeque Grill Recipe page.